Since March 2015 there has been a significant cluster of rabid racoons identified along the Northern edge of Franklin Country (New York), very close to the border with Ontario, Quebec and across the river of Cornwall ON. The most recent case was found in Quebec, only a few hundred meters from the Ontario border. Distribution of wildlife rabies vaccine baits has been completed on the US side, and is currently being done in the bordering areas of Ontario and Quebec (south of the St. Lawrence) as well. 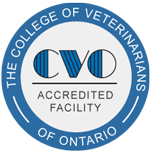 This is a reminder to veterinarians, particularly in Eastern Ontario, to remain vigilant for cases of domestic animal exposure to potentially rabid animals. The last case of racoon rabies in Ontario was detected in 2005, and the last case of fox rabies was detected in 2012. However, there continues to be risk of incursion of fox rabies from Northern regions of the province and of raccoon rabies from New York State. Contact with rabies bats also remains a risk in all regions. The best protection against rabies for domestic animals and people is first to avoid contact with potentially rabid wildlife, and to keep domestic animals up-to-date on rabies vaccination. If you suspect a domestic animal may have recently been exposed to a potentially rabid animal, it should be vaccinated (or revaccinated) as soon as possible. Animal owners should be directed to contact their local veterinarian as the first step of any animal health concerns.